This basket has a length of about 8.5 in, a width of about 8.5 in and a height of about 1.5 in. Beautifully packaged and ready to wow your recipient, our Supreme Snack Basket offers an abundance of sweet and savory treats guaranteed to delight anyone who appreciates the flavor of fresh gourmet nuts. Packed full with four of our finest: Giant Whole Cashews, Colossal California Pistachios, Chocolate Covered Cashews, and Chocolate Covered Almonds. Net wt. 32 oz. Giant Cashews (Cashews, Peanut Oil, Salt); Chocolate Covered Almonds (Milk Chocolate (Sugar, Chocolate Liquor, Cocoa Butter, Milk, Anhydrous Butter, Soya Lecithin, Salt, Vanillin, Almonds, Gum Arabic, Corn Syrup and Confectioner's Glaze); Chocolate Covered Cashews (Milk Chocolate (Sugar, Chocolate Liquor, Cocoa Butter, Milk, Anhydrous Butter, Soya Lecithin, Salt, Vanillin, Cashews, Gum Arabic, Corn Syrup and Confectioner's Glaze); Colossal Pistachios (Pistachios, Salt). I havebought many times before from Superior Nut and have never been disappointed. Fresh tasting, superb design. I wanted to find a gift that had some chocolate, but also a healthier option. The nuts and chocolate covered nuts were a great choice and not so big since I was giving it to a friend and her husband. I'd recommend this product. I ordered six of these baskets for Christmas gifts, and every recipient raved about them. I'm sure I will be ordering again for gifts and now for myself! Arrived quickly and packaged nicely and was a great gift that my friends enjoyed. Excellent quality snacks. Really a great tasting and attractive basket. Nuts were very fresh and tasty. Looking forward to giving this as a gift. How it tastes as good as it looks! Apparently the gift was a hit! Sad to say I did not have the opportunity to do a taste test. ProsDelivered on time as ordered. I purchased this as a gift. It was delivered as planned and very well liked. n very good service, good quality, and prompt delivery! What more needs to be said? I send surprises from the Superior Nut company to my mother - and they are always well received. The Supreme Snack Basket was no exception - and she always loves the interesting basket they come in. Will definitely use again! This is the 2nd year in a row that we have sent a gift from Superior Nut Company. The family members that we receive the gifts rave about how fresh everything is. Very happy with price and the free shipping!! So I bought he some this year. Ordered for Father's Day and Dad received the gift on scheduled day and called to thank me for a wonderful gift. SUPREME SNACK BASKET IS "THE BOMB" !!!!! Well, I can tell you that I have found THE GIFT for him from now ON!! Between the salted cashews and pistachios, and then the chocolate covered almonds and cashews, you have two salty and two sweet and salty Taste Sensations!! 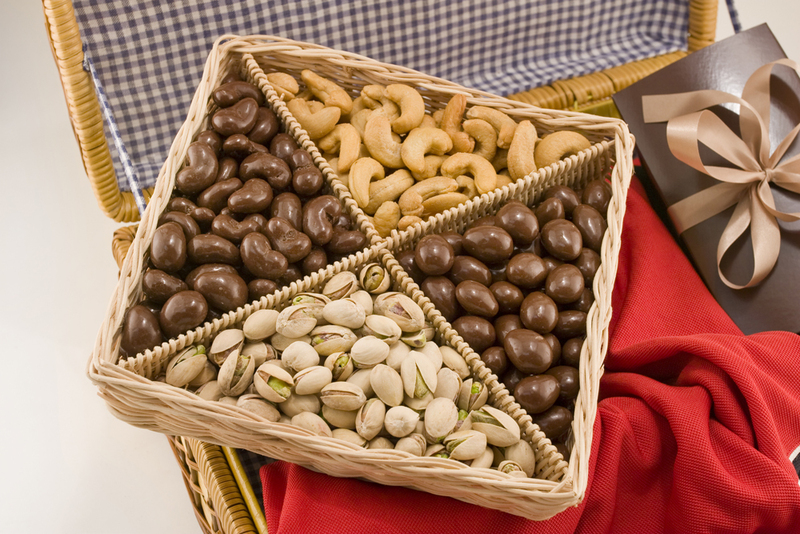 Anybody that loves good quality nuts and chocolate would surely love this gift! I have spoken to him 3 times since his birthday, and every time he says how special and great they are! I would really like to thank you for your quality products, selection, quick delivery, and for being so courteous! I ordered four of these for gifts and they were priced nice and free shipping . All recipients of these nuts were happy and told me the flavor was excellent. I received these for a gift last year and loved them that is why I ordered them this year. This was a Christmas gifts for my kids - they loved it! Will order this again. Ordering was easy. This basket was a gift but I was told the portion size was good and the chocolate covered nuts were delicious. ProsI sent this to my brother-in- law. He eats alot of nuts and said the chocolate covering on the nuts was the best he has ever tasted on nuts. I bought this for my husband for Valentine's Day and he LOVED it. Everything was fresh and delicious. Will def buy again in the future. Thanks! Have ordered numerous items. I have never been dissapointed with a purchase from Superior Nut. Nuts are always fresh and as described. the delivery was great and right on time. Everything was fresh tasty. Prosthis was very good, the taste was outstanding, very fresh. Delivery was great! The gift was well received and excellent. Mom and Dad really enjoyed the basket. they said it was the best nuts and dates they have ever had. thanks for making their Christmas great. The recipients of my gifts of the nuts were very, very pleased with your product. I sent these to my father for Valentineâ€™s and he thought they were wonderful! Thank you so much for providing such a great product! I will be using this site again! excellent nuts and great combination. Products were ordered at last minute & all 5 were delivered as promised, response from recipients were good. I cannot rate the quality of the purchase because i purchased it for a gift, but it did arrive in a timely manner and was a nice presentation. Thank you and happy holidays! The package arrived a few days early which was fine; my mother enjoyed the nuts.